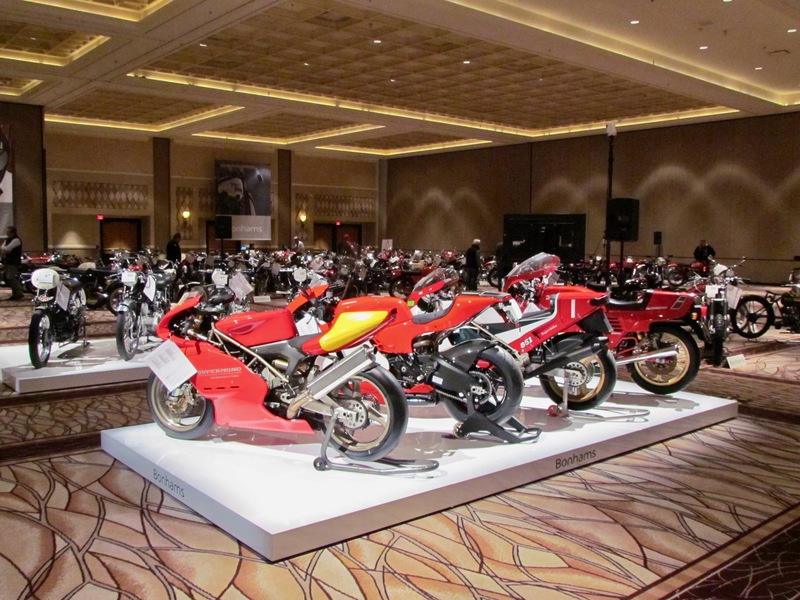 Bidding begins at 1 p.m. Thursday, January 24, at Bonhams 9th annual Las Vegas Motorcycle Auction in a relatively intimate convention-center room at the Rio hotel and casino. 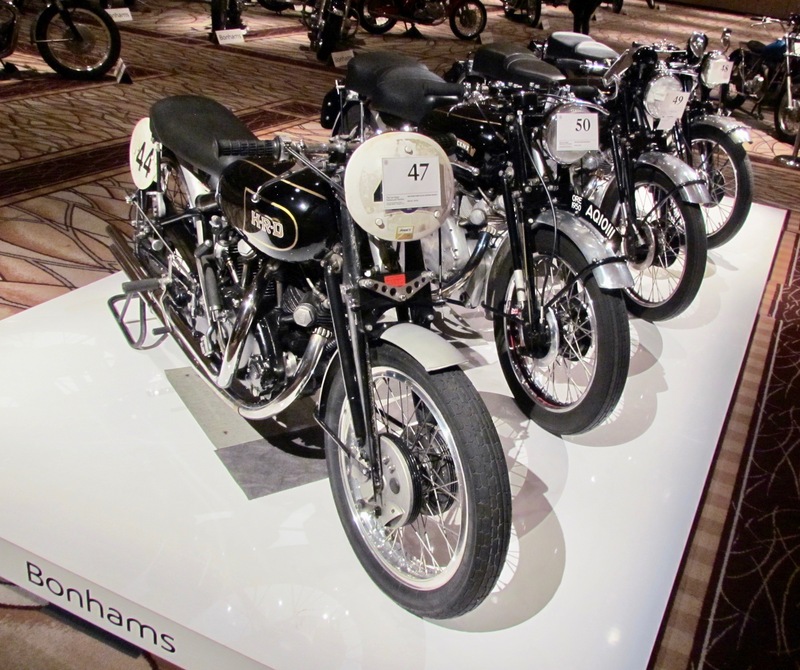 The featured lots include a 1959 Vincent Black Lightning (a ’51 model sold for an auction record $929,000 at Bonhams’ Vegas sale in 2018), a 1974 Munch Mammut, a Wayne Carini barn-found 1916 Harley-Davidson Model 16F, and a collection of nine motor scooters — well, actually 10 since part of the collection is a 1946 Cushman “Husky” Model 53A being carried on a trailer pulled by a circa 1970 Cushman child’s car. The docket for the single-day sale includes nearly 130 lots, a docket as intimate as the room in which the auction takes place. 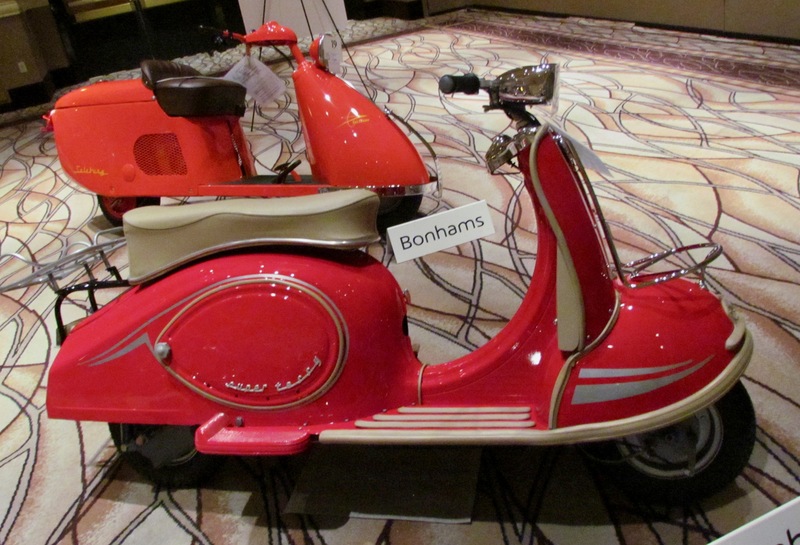 I visited the auction preview Wednesday afternoon and share below what most fascinated me. However, I do so with this proviso: I’m not a vintage motorcycle expert, though I appreciate them very much for their patina and sculptural artistic appeal, as well as for the fact that unlike automobiles, well, except for hot rods, the powerplants are not hidden away beneath sheet metal but are right there in front of you for your fascination as an onlooker, or right there beneath you for your propulsion if you’re a rider. I admit I was drawn to this bike by the “Abstand 100 M” wording on its fuel tank, and by the way the seat appears to be cut into the design rather than simply being plopped atop the frame. Some consider the 750 to be the first superbike, what with its four-cylinder, overhead-cam 750cc engine. 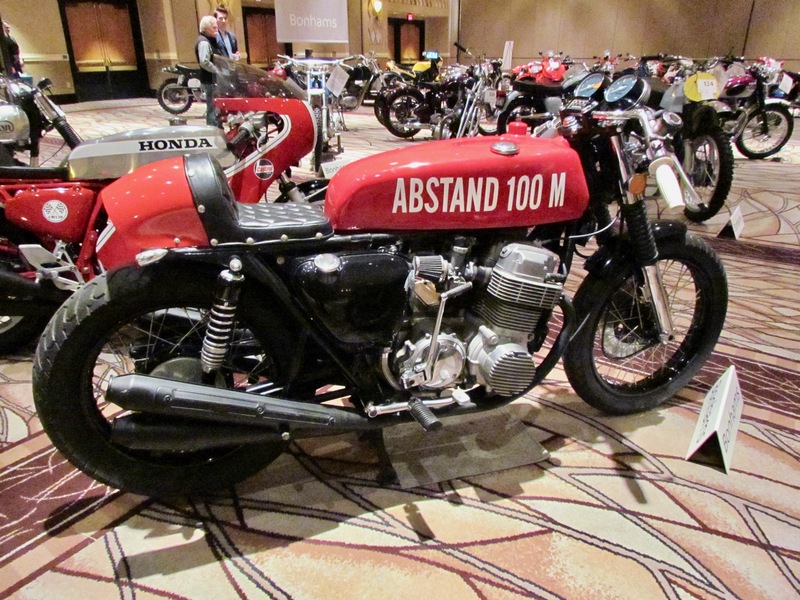 Bonhams notes that this example has received some “clubman” modification and that the “Abstand 100 M” wording is simply German for “stand back 100 meters.” Bonhams expects the bike to sell for $4,000 to $7,000. Buy it and you can make up your own story about why the bike bears such a warning label. Don and Derek Rickman were British brothers and motocross champions. They built their first bike using a BSA frame and gearbox, Norton forks and a Triumph engine, so they called their machines Metisse, the French word for “mongrel.” By 1959 they were producing their own frames; indeed, Bonhams notes that within a decade, the brothers’ company was the largest independent producers of motorcycle frames. 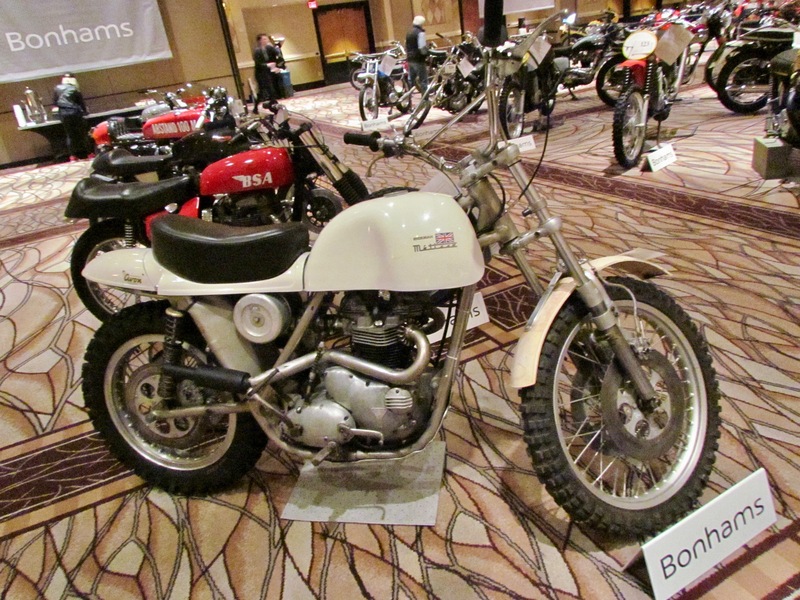 This Triumph-powered Rickman was owned by cross-country racing and national enduro champion John “Buck” Smith, who made some modifications before going racing with it. The Cleveland Motorcycle Manufacturing Company was in business from 1915-1929. This show-winning example has been restored, and with all original parts except for the wheel rims and spokes. 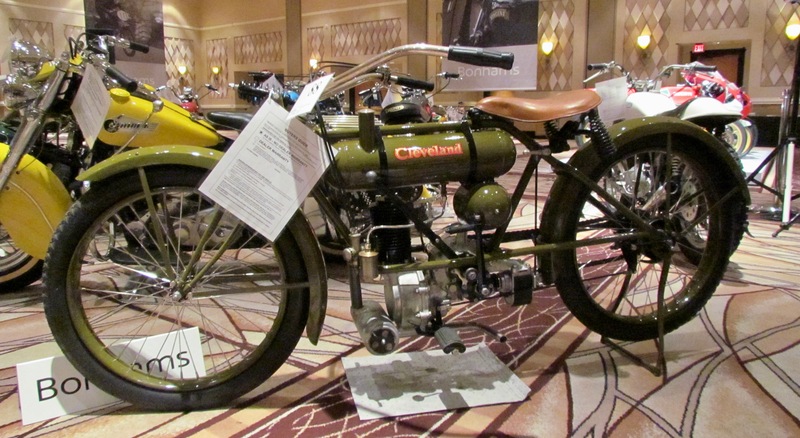 Until 1917, Clevelands didn’t have kick starters; instead, the rider did a “walk-start,” using a compression release when push starting the machine. 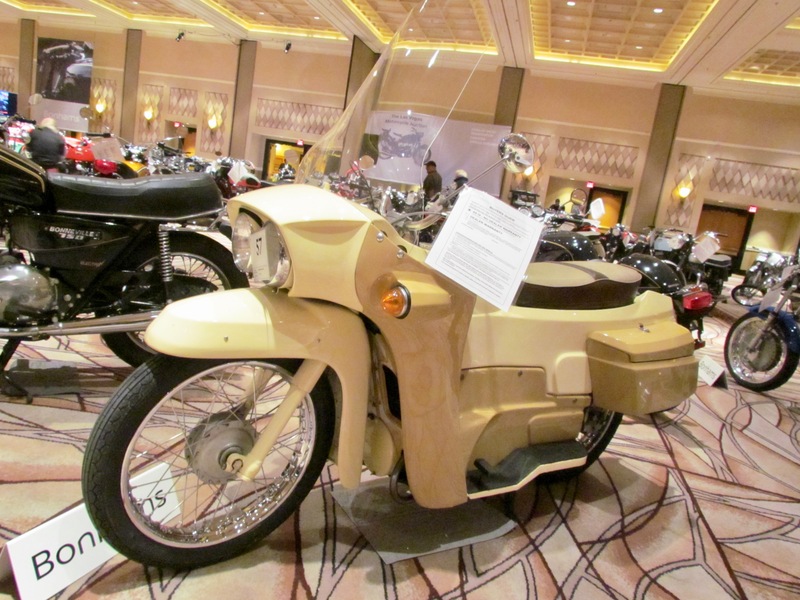 Closest to the camera is a delightfully designed 1957 TWN 141cc Tessy Super motor scooter produced in Coventry, England, by German ex-patriots Siegfried Bettman and Maurice Schultz. TWN was short for Triumph Werke Nurberg, the former German arm of British-based Triumph. The engine was designed by Otto Rieze, formerly of NSU. Parked next to the TWN is a 1949 Salsbury Model 85 scooter, which was advertised as “the most completely automatic vehicle ever built.” Salsbury was based in California. E. Foster Salsbury went the automatic route with car-style foot pedals because he saw drivers as potential buyers for his scooters. Salsbury became part of Northrup Aircraft after World War II but production ended in 1948, as Bonhams explained, “presumably for the lack of sales.” Apparently, those car owners preferred four wheels rather than two. 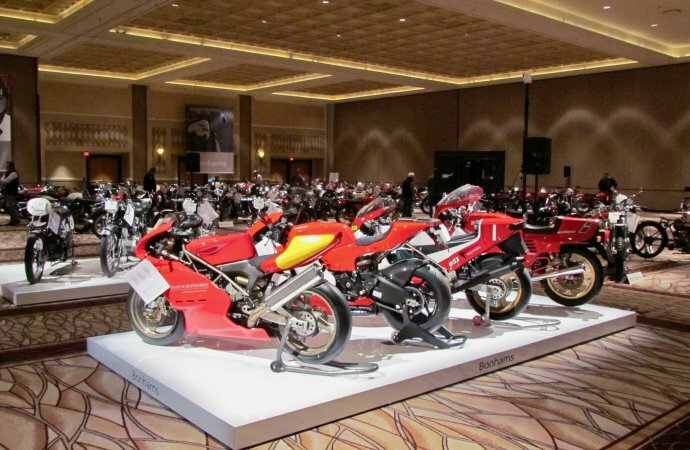 The bike is cool, but I’m including it more because of how it was displayed, with a video monitor not only showing the bike in motion but enabling potential bidders to hear how it sounds as it travels. As for the bike, NSU stands of Necarsulm Strickmachinen Union, maker of knitting machines, and later bicycles and motorcycles and automobiles. 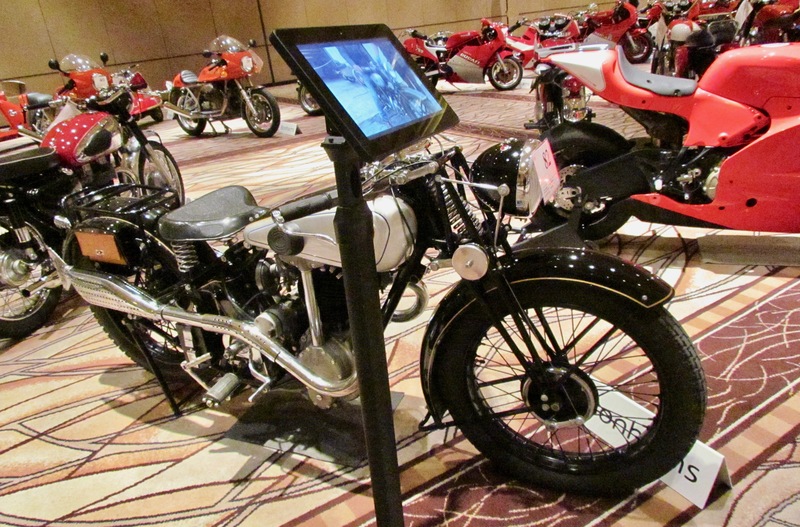 This 1935 NSU is a “high-pipe” model from an era when NSU was the world’s largest motorcycle producer. This bike comes with quite a story. 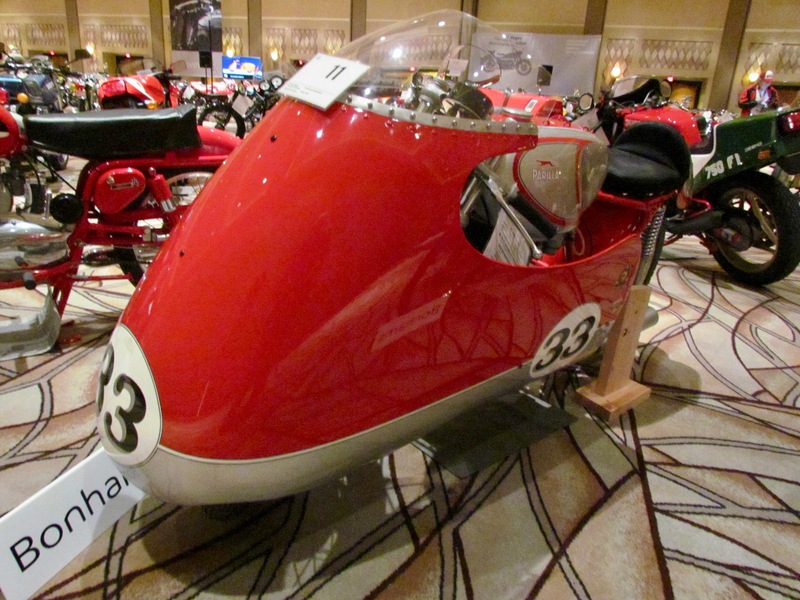 It’s a 1-of-1 because of its nickel-plated chromoly Trackmaster frame, and it was built and owned and raced and jumped (and autographed) by vintage racer Gary Davis. Power comes from a special Powroll speed-shop racing engine built by Pete Fisher; the bike has been clocked at 154 mph at Daytona. Davis used the Honda for touring shows in which he and Rex Blackwell would jump ramp-to-ramp, passing each other in opposite directions while in midair. Davis, also a Hollywood stunt man, did more than 300 such jumps and never crashed. In 1972, he duplicated Evel Knievel’s record feat of clearing 21 parked cars. 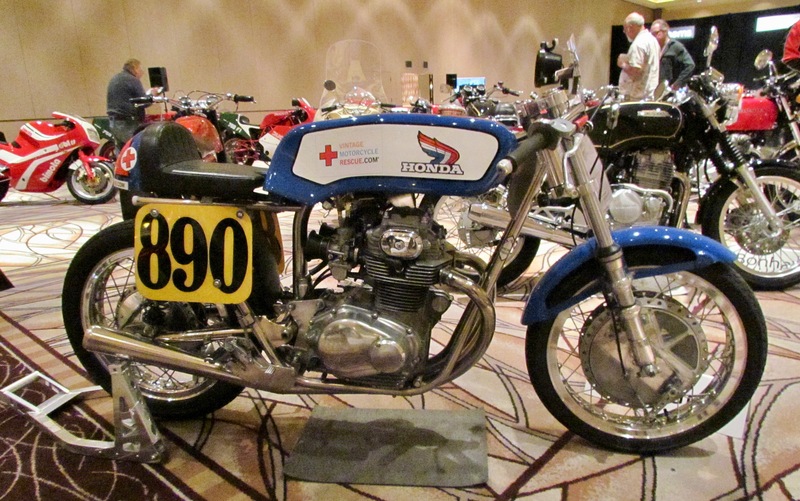 The bike later was acquired by Vintage Motorcycle Rescue but still wears Davis’ 890 racing number. Veloce Ltd. was founded in Birmingham, England, in 1904 and started using the Velocette name in 1913. After World War II it produced special closed-body bikes for British police. Such bikes could be ridden while wearing normal clothing and Velocette started producing the Vogue for public use in 1963. But the bikes were expensive, and the motor scooter became the two-wheeled rage so that only 381 Vogues were produced before production ended in 1968. With a 4-year-old grandson and an 8-year-old granddaughter, taking this home might lead to a civil war within my daughter’s family. But they make a delightful pair — the car and scooter as well as the grandchildren. 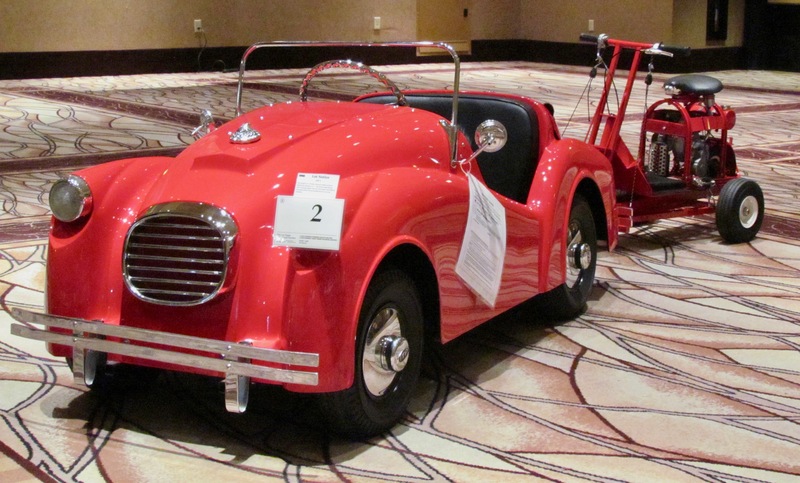 The child’s car was built as part of a carrousel ride but later was fitted with a steel frame and a rear-mounted Cushman engine. It also has a full-size steering wheel that’s center mounted, leading to a belief that it might have been converted for use as a Shriner’s parade vehicle. The Rickman-Metisse with period Airheart "spot disc brakes" (the term back then) is a real find. As for that #890 Honda..I’d check really carefully to make sure you were getting the correct engine and everything else, personally…..